High-resolution LED-backlit glossy widescreen display with support for millions of colors. 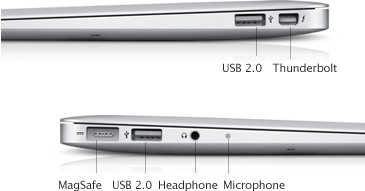 Ultrathin and ultralight unibody aluminum construction. Configurable to 256GB flash storage, only at the Apple Online Store. Powered by a dual-core Intel Core i5 or i7 processor and DDR3 memory. ?Configurable to dual-core 1.8GHz Intel Core i7 with 4MB shared L3 cache, only at the Apple Online Store. Advanced Intel HD Graphics 3000. USB 2.0, Thunderbolt, headphone port, MagSafe power port, SD card slot (13-inch model). Latest Wi-Fi and Bluetooth technologies. Stereo speakers, microphone, and headphone. Your MacBook Air comes with 90 days of free telephone support and a one-year limited warranty. Purchase the?AppleCare Protection Plan?to extend your service and support to three years from your computer?? purchase date. Only the AppleCare Protection Plan provides you with direct telephone support from Apple technical experts and the assurance that repairs will be handled by Apple-authorized technicians using genuine Apple parts. For more information, visit?Apple support?or call 800-823-2775. With the Mac App Store, getting the apps you want on your Mac has never been easier. No more boxes, no more discs, no more time-consuming installation. Click once to download and install any app on your Mac. But if an app you need isn?? available from the Mac App Store, you can use DVD or CD Sharing. This convenient feature of OS X lets you wirelessly ??orrow? ?the optical drive of a nearby Mac or PC. So you can install applications from a DVD or CD and have full access to an optical drive without having to carry one around. Purchase from the Apple Online Store to upgrade processor, memory, and flash storage. Apple takes a complete product life cycle approach to determining our environmental impact.? Learn about Apple?? dedication to reducing the environmental impact of our products and process. ?Or read our?Product Environmental Reports?for detailed information on the environmental performance of every Apple product. Apple takes a holistic view of materials management and waste minimization. ?Learn more about how to recycle your Mac or PC. LWAd?is the statistical upper-limit A-weighted sound power level (rounded to the nearest 0.1 B). LpAm?is the mean A-weighted sound pressure level measured at the operator position (rounded to the nearest dB).